GI Issues: Could you join the Pepto Bismol lineup? Does this Pepto Bismol lineup describe you? Everyone has times in life when their GI tract seems to revolt: upset stomach, bloating, diarrhea, constipation and the list goes on. Sometimes the symptoms are severe and you need to get to a doctor but often you can try a few things yourself. Before you panic and think you have colon cancer or celiac disease, try some simple steps to see if you can improve your situation. If you have recently taken antibiotics, you may have diarrhea or if you get it every time you take them, start taking a probiotic when you start the antibiotics. You will be amazed at how much better it goes. For this, a basic probiotic from the store will work. Constipation is an issue no one likes to bring up but it can make life very uncomfortable. Often the cause is low fiber or not enough water or a combination of both. College students often average only 10 grams of fiber a day and it should be between 25 and 35 grams for good health. Water intake can be low if you don’t carry a water bottle or you don’t like water. There several action steps that can be taken to improve reflux, IBS, and other GI issues as well but talking to a dietitian to personalize your plan is best. Stomach Flu – What to Do? After 3 (three) to 4 (four) hours, if your nausea had diminished and you have not vomited, you can then try eating some dry foods. Again, start small and slow and think bland or boring. Saltines (soda crackers), pretzels, and dry plain toast are good options. After another 3 (three) to 4 (four) hours with no vomiting or worsening of your nausea you can advance to more substantial food, but again small and slow and boring. Try some soup with rice or noodles, plain rice, baked potato (no toppings), or bread products (no toppings). If it has been 24 hours with no incidence of nausea or vomiting you can then progress to a more substantial bland diet and include items such as skinless chicken breast, banana, or applesauce. Best to avoid fatty, greasy, and spicy foods, as well as milk products. Give it a day or two for your stomach to recover before resuming your regular diet. If you find that your nausea and vomiting is not going away and it has been more than 24 (twenty-four) hours since it’s onslaught , schedule an appointment with your doctor. There are vegetable and fruit options available. Start thinking about what vegetable and /fruit you are going to have with your meal first. You will begin having more because you will become mindful of these foods. Stores now have more individual vegetable and fruit portions which you can put on your shopping list, especially in the freezer section. 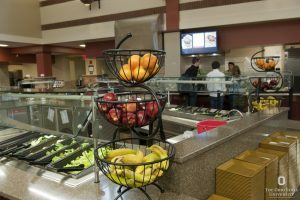 If you are living in an apartment off campus and on the meal plan, there are vegetable and fruit based items you can add as sides and if you don’t see any ask. Eating better is about progress not perfection because eating perfect every day is not realistic. If you work on one healthy habit each month by the end of 12 months you will be amazed at how much you have changed. Going to the dietitian can be exciting for some and terrifying for others. 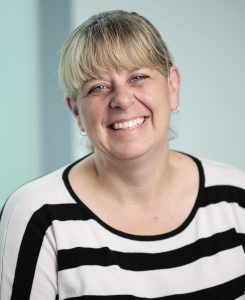 The Student Life Student Health Services dietitian has experience with college students and the health issues they may have related to eating. She is able to coach you with understanding that you are on the meal plan or a budget. Her advice is realistic based on where you are in life right now which is college and all the demands that go with life. She has helped our students: manage diabetes, learn how to eat for Polycystic Ovarian Syndrome, lower cholesterol, lose weight, deal with food allergies, adjust for gluten intolerance, eat vegetarian and make progress at being healthier with their eating habits. Appointments can be scheduled by going on line or calling. You don’t need to have a referral but you should check with your insurance to make sure you are covered. 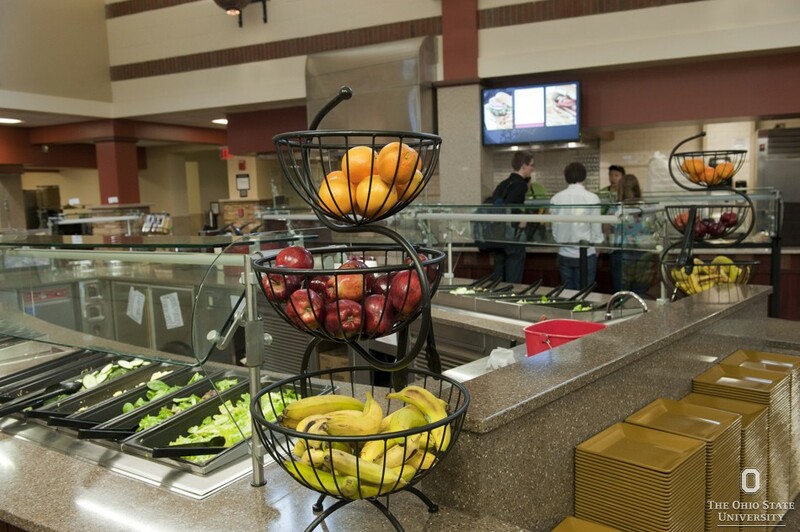 The dietitian is covered by the Comprehensive Student Health Insurance plan. Canker sores, known as aphthous ulcers to the scientific world, are painful sores that develop inside the mouth. They can form on the inside surface of the cheeks, at the base of the gums, on the soft palate or on/under the tongue. They are small and shallow and are round to oval in shape with the base usually covered by a white or gray membrane. An intense red halo commonly surrounds each ulcer. Canker sores should not be confused with cold sores. Cold sores, also called fever blisters, are groups of painful fluid-filled blisters. They are caused by the herpes simplex virus. While canker sores are not contagious, cold sores are, extremely so. They usually form on the lips and nose and sometimes on the gums. The exact cause of canker sores is unknown. Some people will develop canker sores after eating large amounts of citrus or acidic fruits and vegetables. This includes, oranges, pineapple, lemons, tomatoes, strawberries, and figs. Minor injury may also be a cause. Injuries can be caused by overzealous brushing of the teeth, accidental cheek bite, a sharp tooth surface, or rubbing of braces/retainer. Toothpastes containing sodium laurel sulfate (SLS) may also lead to canker sores in some people. SLS is a chemical added to most toothpaste to create the foaming action which aids in the cleaning of teeth. Health conditions, such as celiac disease or Crohn’s disease. Deficiencies in vitamins B12, zinc, folic acid, and iron. No special treatment is required for canker sores. They will heal on their own in 1-2 weeks. If treatment is desired, over-the-counter oral pain medication, such as ibuprofen (Motrin, Advil) or naproxen (Aleve) can be used for the pain. Topical medications containing benzocaine, such as Anbesol, Kanka, Zilactin, and Orajel canker sore gel can be purchased without a prescription. These medications can numb the pain and cover the open ulcer. Prescription medications containing steroids such as triamcinolone in dental paste and Kenalog in Orabse can be used to hasten healing and decrease pain. To prevent canker sores, avoid dietary triggers and eat a well-balanced diet. Maintain good oral hygiene. Protect the mouth by brushing and eating carefully. Address problems with braces, retainers, and sharp tooth surfaces. Reduce stress. Avoid toothpaste with SLS, if it appears to be triggering mouth sores.